Take a look at the 10" Patriot Series, Red Coat Series, Legend Series, Signature Series and more to find just the right speaker you need for your cabinet. If you are replacing your old, tired speaker, we can help. 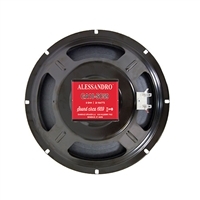 LoudspeakersPlus has the 10" guitar speaker that will make your rig come alive. Speakers range from low-power Alnico vintage types to tougher speakers with a fat meaty sound. And be sure to download the pdf spec sheet to get all the details and parameters for each speaker.